When outside burdened world gets too much to take, to take a break, I get back in touch with my sanctuary. Attacks withstood, storms endured knocked-off, pale, weary, fragile me celebrates the joy my heart yearns for; responds to the holiest, purest call what my soul has longed for, quenches the thirst that my throat has been carrying around for years. My potential ‘boyfriend’ who I met online came to meet me all the way from America. On the first date I decided to take him out for breakfast- to my sanctuary- a destination unknown to him. Just to see what kind of a soul resides in his body. As the first light of dawn turned the sky golden, we got on a local bus, took the highway to heaven, shared some chitchatting and laughter with some ‘never seen before’ passengers who always wear colorful clothing with dazzling clarity. For an hour or so, we rode past miles after miles of gorgeous greenery, vastness, huts with haystack roof, open air village markets, women walking carrying mud pitchers on the head filled with drinking water, fertility, healing and wisdom…. The driver dropped us off in the middle of nowhere. We were back to a world that was unchanged since the time of Christ. Here the infinite sky rests its root in the river. The blazing sun kisses the knee-high rice saplings from up above. The air is dense with hoots and cheers and tweets of birds. Full-fledged larger-than-life trees cast lacy shadows on the silver waves of the river. Lazy, scented wind sifts through the wildflower bushes. Here human souls can see, hear, touch, feel the unchained melody coming from heaven beneath. (I saw the irises of his jet-lagged eyes widen). He cooked us Potato Cakes. The smell of life hung everywhere. And my heart started throbbing! 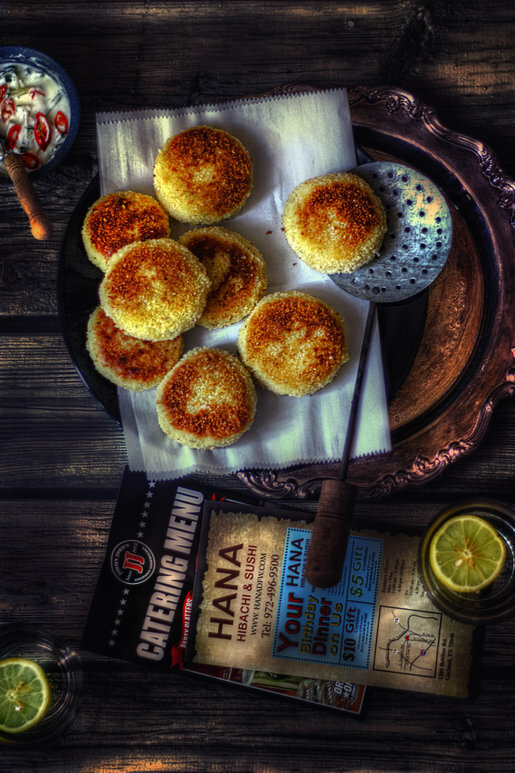 Smoking hot & crispy, crunchy, spicy warm potato cakes served on pearl white rice. Match made in heaven. So well-seasoned! Perfectly spiced! Memorably good taste & texture never weighs me down! *Mix first 7 ingredients. Chill/refrigerate it overnight for the best results. Let the flavors mingle. *Dunk patties into egg and then roll them into bread crumbs. shake excess crumbs. Heat oil in a large nonstick skillet/pan over medium-high heat until almost smoking. *Add the potato cakes to the pan and reduce the heat to medium-low. *Cook until they have formed a golden crust, 15 to 20 minutes. Turn and cook the other side until golden brown, another 15 minutes. You can add any herb with Potato cakes. 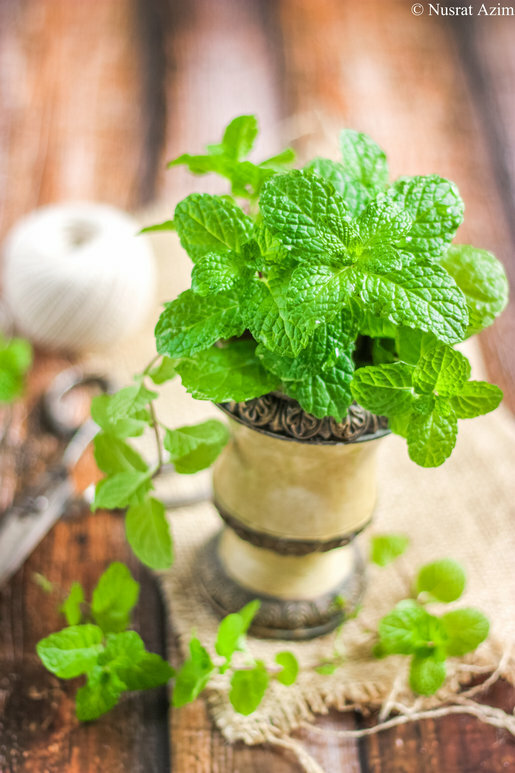 But Fresh Mint from my garden fills up my senses delightfully. Why Mint? 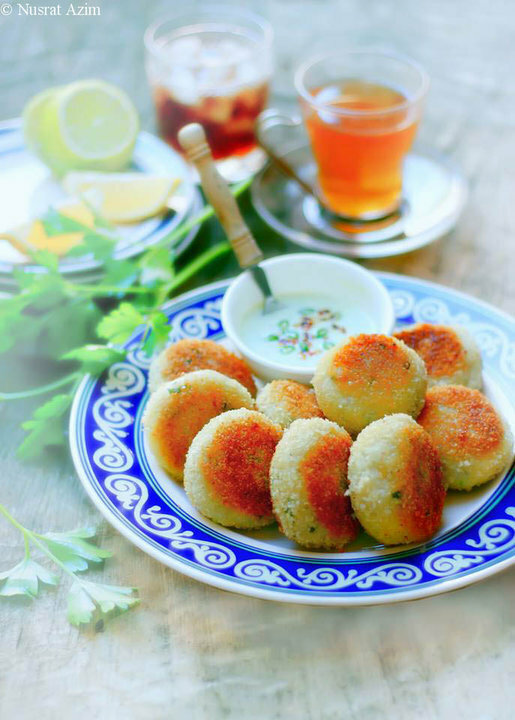 – My peasant-chef prefers Mint over any other herbs when it comes to Potato cakes. As the sunset painted the sky all over with intense ruby red hue, I saw tear drops falling from his deep soulful eyes. May be like me he has scars caused by agony, fire, fear of failure, greed, struggle, suffering, sickness. May be he too dies an unthinkable death once in a while. May be that humble restaurant with a simple meal recovered, refreshed and lifted up his spirits stimulating his appetite. May be the departed part of his soul has been resurrected here. Right in front of that worn-out sanctuary – that Cathedral- that Temple, when he asked if I would be willing to sail away with him again, I replied, ‘YES’. An unprepared fun, whimsical ride turned into a blissful adventure of a lifetime. 1 | Submitted by Meghla Manush (not verified) on Thu, 22/08/2013 - 12:04pm. The only thing that forced me to click this link was the word 'Potato'. The only thing that forced me to type this comment are the 'awesome presentations with Potato'. Well, this is one of nicest 'potatography' that I have seen so far. I will follow the recipe, and will try to mimic the decorations (may fail awfully, but I will give it a try). Thanks for the post dedicated to Potatoes. 2 | Submitted by uchhola [Guest] on Thu, 22/08/2013 - 7:25pm. 3 | Submitted by Wali Khondker (not verified) on Thu, 22/08/2013 - 4:12pm. Something that is meant to inspire someone is said to be inspirational. Pieces of art and literature can be inspirational to inspire all and sundry. Speeches by great public celebrities can be inspirational to a great extent and can arouse fervour and enthusiasm in others. Coming to Suborna's 'First Date. Potato Cakes' with inspirational words of her culinary expertise and wisdom of 'First Date', described with most polite and cordial, with a mellifluous, well-educated tone is a similitude of poetry to my ear! Food is not an inspirational business; it's a rational procedure to do sensible and hopefully beautiful, gastronomically enjoyable dishes; that's all. Anything that is inspirational has great value and wisdom attached to it! Suborna does exactly that with her narratives, recipes and foodographies! It is indeed the experience and excellence in herself, which come up with such abilities of describing food and recipe mingled with hilarity of first date is like prose, poetry and literature, all in one! Popular celebrities all over the world share their wisdom and knowledge through their popular quotes which leave an indelible impression on our mind. Suborna's culinary writeup with inspirational words and mesmerizing foodography have the capability to bring about great changes in the gastronomic scenario too, as in the case of numerous connoisseur of food where great chefs have been inspirational! Everyone is fighting their own battle to be free from their past, to live in the present and create a meaningful future for themselves. I wish Suborna Godspeed! 4 | Submitted by uchhola [Guest] on Thu, 22/08/2013 - 7:25pm. Are you planning to kill me with your kindness?! 5 | Submitted by himika64 on Mon, 26/08/2013 - 5:57am. Made it yesterday for guests. Had to dip it in egg white before frying to hold it together. 6 | Submitted by uchhola [Guest] on Mon, 26/08/2013 - 7:59pm. 7 | Submitted by cresida [Guest] on Sun, 08/09/2013 - 8:52pm. Same colorful presentation! the window of seeing something exceptional, and you are an artist of double FF (food and flower); always saw the combination of these two; always looks gr8! 8 | Submitted by uchhola [Guest] on Sat, 12/10/2013 - 6:46pm. 9 | Submitted by Shashtha Pandava on Sun, 29/09/2013 - 1:40pm. I like your posts for their language (so unique and straightforward! ), unique presentation of foods, tantalizing (!) pictures of dishes. Recipes are simple, foods are very familiar but with a different approach. Carry on Sis!! A little improvisation. When making patties put a pinch of mixture of chopped and caramelized onion + green chili + coriander leaf + mint + a very small piece of Dhaka cheese. Bit an egg, dip cakes into it, roll over cornflower/bread crust/powdered puffed rice then do the frying job. 10 | Submitted by uchhola [Guest] on Sat, 12/10/2013 - 6:48pm. Your 'improvisation' made me drool profusely! I sure will try patties your way. Soon. 11 | Submitted by guest_writer on Mon, 25/11/2013 - 4:50pm. How often we see someone integrating an wonderful story with some delicious food and flowers? But you've done that so elegantly. Really loved the storytelling in every sentences and the photography is simply astonishing, haven’t seen these kind of vivid pictures lately, so eye soothing. And potato cakes? I’m just planning to make these within a few days in one of my country presentations here in Germany; hope to make this as 'Alur Chop' with Khichuri and i know how obsessed the Germans about potatoes are. And again, thank you very much for this brilliant conglomeration of Love, Food and Flowers!! 12 | Submitted by uchhola [Guest] on Thu, 27/02/2014 - 6:10am. 13 | Submitted by monmajhi [Guest] on Thu, 27/02/2014 - 6:39am. 14 | Submitted by uchhola [Guest] on Wed, 05/03/2014 - 10:13pm. 15 | Submitted by Durdanto on Tue, 11/03/2014 - 12:18pm. Nice. What is this place where rice saplings grow and they make potato cakes like this? ...the Christlike chef in a place unchanged since Christ....loved the wordplay. 16 | Submitted by uchhola [Guest] on Fri, 03/10/2014 - 8:43pm.